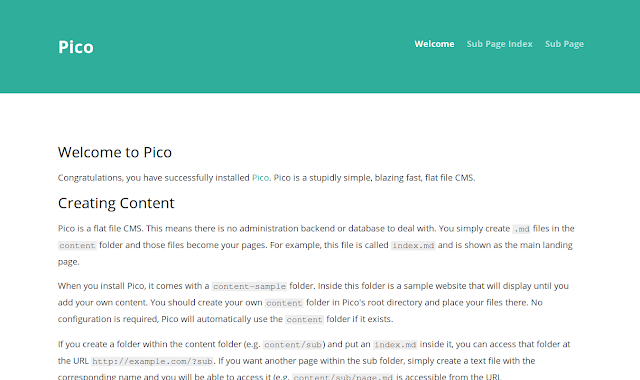 Pico is an open source Content Management System. It is a flat file CMS, which means that there is no administration backend or database to deal with. You simply create markdown files in the content folder and those files become your pages. There’s much more to Pico than that though. In this tutorial, we will show you how to install and configure Pico CMS on an Ubuntu 16.04 server. One Ubuntu 16.04 server installed either on bare-metal hardware or on a virtual machine with non-root user with sudo privileges. Now we need to create an Nginx server block for Pico CMS. You can do this by creating pico.conf file inside /etc/nginx/sites-available/ directory. Now, Open up your web browser and access the URL http://labserver.example.com or http://labserver_ip. You should see the Pico CMS default web page as shown in image below. Now, you have Pico CMS installed on Ubuntu 16.04 server. You can create your own content folder in Pico's root directory, create .md files in the content directory and those files become your web pages.